Here’s a question for you. How would you draw a mechanism for the following reaction? Well, there’s two ways to draw it. The 1,2-addition, that comes first. That’s clear. Now what? Well, you could draw the reaction one of two ways: Let’s see them. You might think – how much does it really matter? and to some extent, you’re right: the big points are there – 1,2 addition, 1,2 eliimination, and then deprotonation. And I could imagine a lot of TA’s and/or professors would be happy with either answer from their students. The discussion could just end there. I’d like to dig a little deeper than that. To make a long answer short, I’ll tell you right now that the second mechanism is more correct. Given that information, one option in front of you is that you could just learn to memorize a new rule: Do proton transfers before you do 1,2-eliminations. The second way to do it is to think this through, and apply some fundamental concepts to this question. This is time-consuming in the short term, but pays dividends in the long term, because the principles will apply to other problems you will encounter, and it will make your knowledge less fragile. Here’s why the right way is to do the proton transfer first. Let’s look at these two mechanisms carefully. In the first one, we have addition of water to give the zwitterion (it has two charged species in it, the O- and the OH2) and the O- coming down to kick off Cl-. 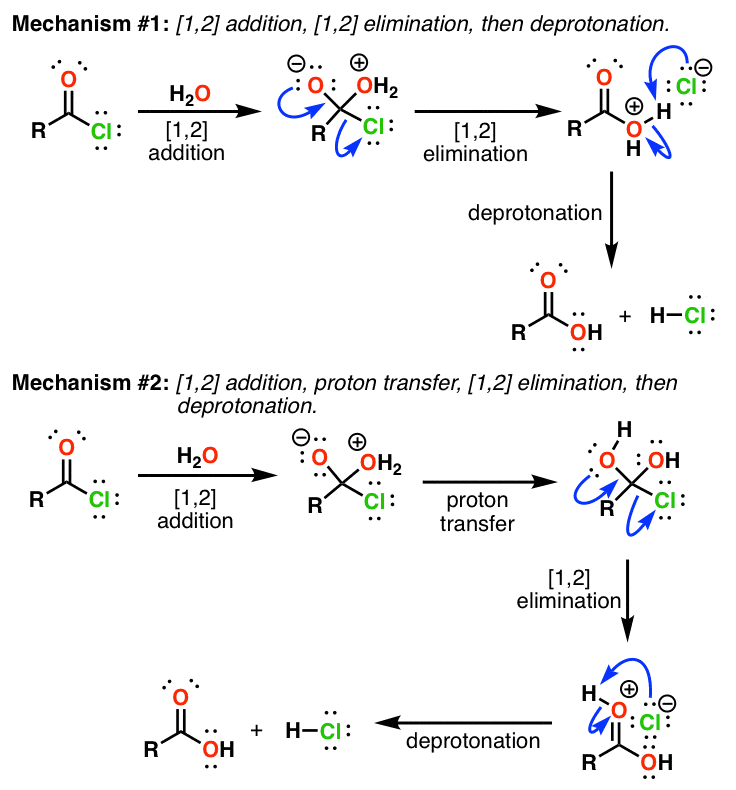 In the second mechanism, you have proton transfer from OH2 to O- (neutralizing the zwitterion) and then a 1,2 elimination to regenerate the carbonyl. Which one makes more sense? To answer this, you need to think about two things: 1) The rate of proton transfer, and 2) the rate of 1,2-elimination. Let’s look at the proton transfer. This is an acid-base reaction. When you look at the pKas, you see that the OH2 is a strong acid (about -1 or so) and the O- is a strong base (the conjugate base of an alcohol, about ~16). [note1]. That’s a difference in pKa of about 17! As you are no doubt well aware, it takes a certain bravery to drop pellets of NaOH into, say, a 2 M aqueous solution of HCl. That’s about the difference in pKas we’re dealing with here. Given the huge difference in pKas, we should expect a very vigorous acid-base reaction here too. In fact, the lifetime of that O- under the reaction conditions should be extremely short. Proton transfer should be favored here. Hold on for a second: one might say that 1,2 elimination from the negatively charged oxygen to kick off Cl- is super-fast due to the fact that O- is a much better nucleophile than OH. Let’s look at that possibility. 3) the molecule re-hybridizes from tetrahedral to trigonal planar. Look at that last part – the atoms have to move when we re-hybridize, as we change the angles from 109 to 120. So it’s not enough that the oxygen lone pair just comes down – we have to rearrange the molecular furniture as well! Compare this to proton transfer of H+ to HO- . Is there any re-hybridization? No. It starts off sp3 and ends up sp3. No reorganization. It goes on and comes off without any fuss. The key lesson here is: just because you “know” a reaction is going to happen a certain way, don’t put your blinders on – the concept of pKa doesn’t go away just because you’re working on the carbonyl unit in your class. Trust in your pKa table. If you see an obvious acid-base reaction that can happen in your molecule – make it happen. A good rule of thumb when drawing these reactions is to do your proton transfers to neutralize zwitterions first, before you get fancy with 1,2-eliminations. It’s a subtle point, I grant you that, but it’s an example of some key principles in action. [Note 1]: Those aren’t exact values because we’re dealing with a slightly different molecule but they’re pretty close. Isn’t pka of water H2O is 16 and you mentioned -1? The bit about pKa values favoring the proton transfer is valid, but pKa values don’t speak to the speed of a reaction as implied in the text. pKa values are thermodynamic values. Acidity and basicity are fundamentally thermodynamic values. And although a reaction might be thermodynamically favorable, that doesn’t say anything about the speed or the kinetics of the reaction. I think I m highly blessed to visit your website! It shows your extreme dedication towards yur blog . Awesome stuff.